Roger Penrose, one of the most accomplished scientists of our time, presents the only comprehensive and comprehensible account of the physics of the universe. 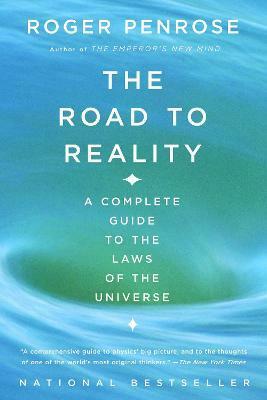 From the very first attempts by the Greeks to grapple with the complexities of our known world to the latest application of infinity in physics, The Road to Reality carefully explores the movement of the smallest atomic particles and reaches into the vastness of intergalactic space. Here, Penrose examines the mathematical foundations of the physical universe, exposing the underlying beauty of physics and giving us one the most important works in modern science writing. 1.3 Is Plato’s mathematical world ‘real’? 3.4 Do natural numbers need the physical world? 6.1 What makes an honest function? 6.4 The ‘Eulerian’ notion of a function? 9.6 What kind of function is appropriate? 11.2 The physical role of quaternions? 12.1 Why study higher-dimensional manifolds? 14.1 Differentiation on a manifold? 16.2 A Wnite or inWnite geometry for physics? 21.6 What is quantum ‘reality’? 24.2 Why do antiparticles imply quantum fields? 25.8 Beyond the standard model? 27.5 Derivation of the second law—or not? 27.6 Is the whole universe an ‘isolated system’? 28.5 Are the motivations for inflation valid? 28.7 The Big Bang’s special nature: an anthropic key? 28.10 Cosmological parameters: observational status? 29.8 Can other conventional ontologies resolve the ‘cat’? 29.9 Which unconventional ontologies may help? 30.1 Is today’s quantum theory here to stay? 30.6 Killing vectors, energy flow—and time travel! 31.8 String theory as quantum gravity? 31.10 Why don’t we see the extra space dimensions? 31.11 Should we accept the quantum-stability argument? 31.13 Is string QFT finite? 31.18 The physical status of string theory? 32.7 Status of loop quantum gravity? 33.14 The future of twistor theory? 34 Where lies the road to reality? 34.1 Great theories of 20th century physics—and beyond? 34.4 Can a wrong theory be experimentally refuted? 34.5 Whence may we expect our next physical revolution? "What a joy it is to read a book that doesn't simplify, doesn't dodge the difficult questions, and doesn't always pretend to have answers. . . . Penrose's appetite is heroic, his knowledge encyclopedic, his modesty a reminder that not all physicists claim to be able to explain the world in 250 pages." "For physics fans, the high point of the year will undoubtedly be The Road to Reality." "A comprehensive guide to physics' big picture, and to the thoughts of one of the world's most original thinkers." --The New York Times "Simply astounding. . . . Gloriously variegated. . . . Pure delight. . . . It is shocking that so much can be explained so well. . . . Penrose gives us something that has been missing from the public discourse on science lately-a reason to live, something to look forward to." --American Scientist "A remarkable book . . . teeming with delights." --Nature "This is his magnum opus, the culmination of an already stellar career and a comprehensive summary of the current state of physics and cosmology. It should be read by anyone entering the field and referenced by everyone working in it." --The New York Sun "Extremely comprehensive. . . . The Road to Reality unscores the fact that Penrose is one of the world's most original thinkers." --Tucson Citizen "What a joy it is to read a book that doesn't simplify, doesn't dodge the difficult questions, and doesn't always pretend to have answers. . . . Penrose's appetite is heroic, his knowledge encyclopedic, his modesty a reminder that not all physicists claim to be able to explain the world in 250 pages." --The Times (London) "For physics fans, the high point of the year will undoubtedly be The Road to Reality." Roger Penrose is Emeritus Rouse Ball Professor of Mathematics at Oxford University. He has received a number of prizes and awards, including the 1988 Wolf Prize for physics, which he shared with Stephen Hawking for their joint contribution to our understanding of the universe. His books include The Emperor's New Mind, Shadows of the Mind, and The Nature of Space and Time, which he wrote with Hawking. He has lectured extensively at universities throughout America. He lives in Oxford.